Cake is a staple dessert for countless traditions, from birthdays and weddings to graduations. But, in recent years, cupcakes have become more popular as crowd-pleasing desserts for fancy occasions or casual treats. The differences between baking a cake and cupcakes are subtle. Basic cake or cupcake recipes usually comprise the same ingredients: butter, sugar, flour, eggs and a pinch here and there of ingredients such as salt or baking powder. If you're baking a simple cake or plain cupcakes that follow a similar recipe, the proportion of ingredients should be about the same. But, if your recipe is more complicated, such as angel food cake, you may have to alter the proportions of ingredients slightly to accommodate the size of whichever cake you choose to make. The most obvious difference between a cake and a cupcake is size, which depends on the container in which the dessert is prepared. Cakes are baked in large pans, usually round or square, and take half an hour or more to bake fully. Cupcakes, on the other hand, are baked in tins with several cups. 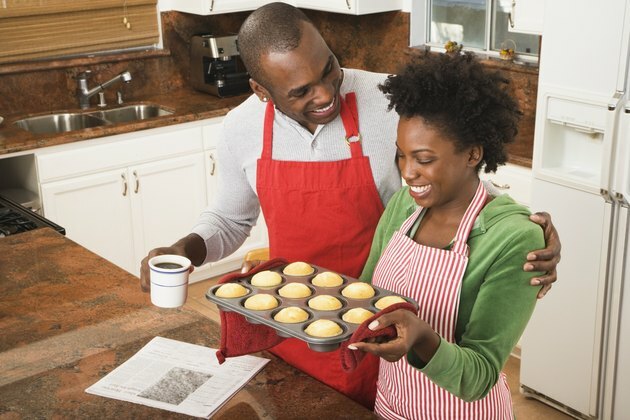 Each cup is much smaller than a large cake pan, so a batch of cupcakes usually takes only about 15 minutes to bake. Cake and cupcakes can be iced or frosted using the same techniques or very different techniques, depending on your skill and creativity. Cakes can be iced easily with a spatula and a can of icing, and decorating with frosting tips is optional. But cupcakes tend to look messy unless they're frosted with a pastry bag and tip, so they take a little longer to decorate. As far as frosting flavors, anything goes for either cake or cupcakes -- frost with your favorite. Cupcakes are far easier to eat and serve than cake. They're the ultimate finger food, usually served in paper cups and extremely portable, even bite-size. Traditional cake requires a plate and fork. Cupcakes often are thought of as a more versatile option for parties or other events where lots of people will be reaching for dessert, though some people prefer the traditional custom of cutting into a cake.